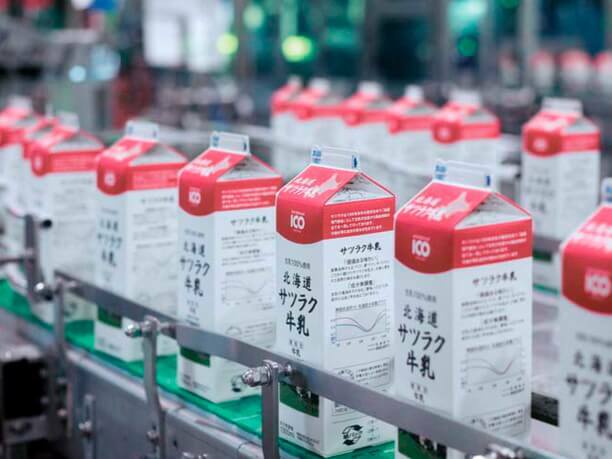 Enjoy a Factory and farm tour at the Satsuraku Milk No Sato! 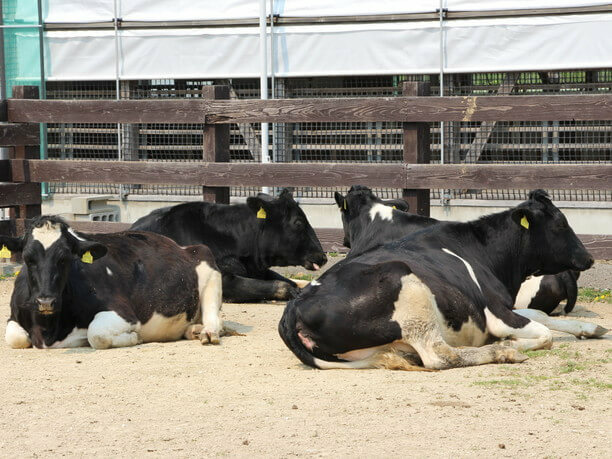 Hokkaido accounts for 50% of Japan’s domestic raw milk production. Many people enjoy seeing the sight of cattle eating fresh grass in the meadow. 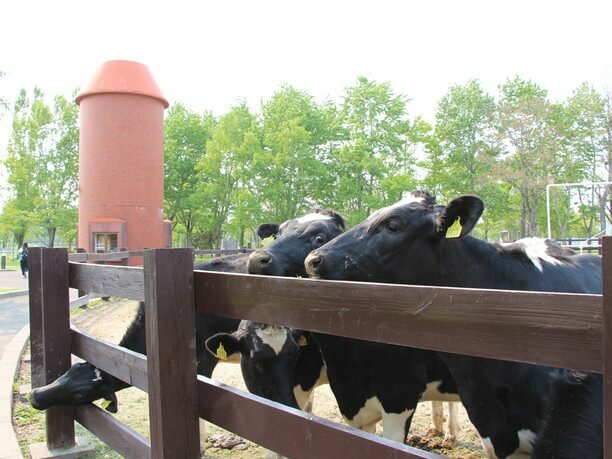 While in Sapporo city, you can enjoy the atmosphere of the idyllic farm “Satsuraku Milk no Sato,” located in the corner of Sapporo. 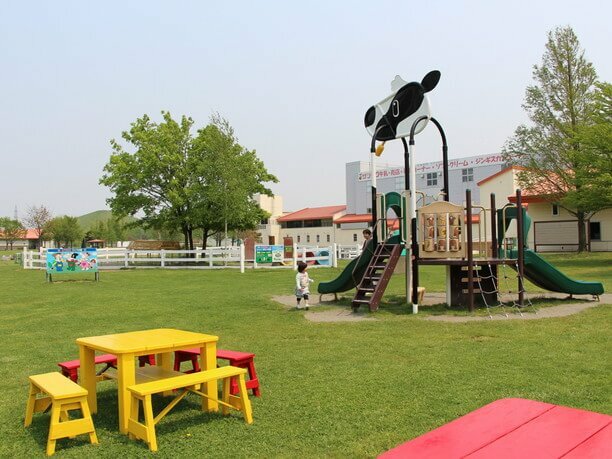 It is an agricultural experience facility. 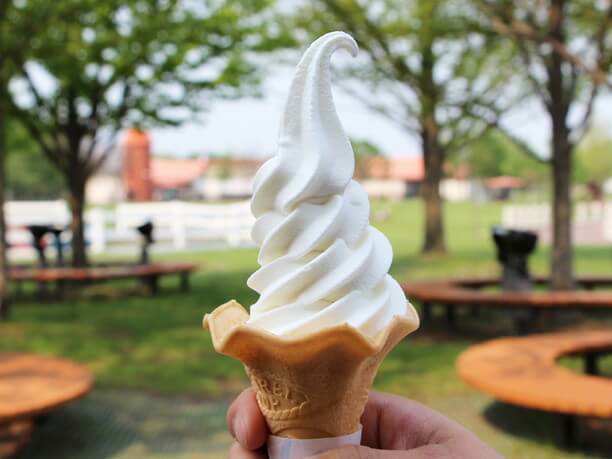 You can visit the milk and dairy products factory, have contact with cows and enjoy their delicious soft-serve ice cream! 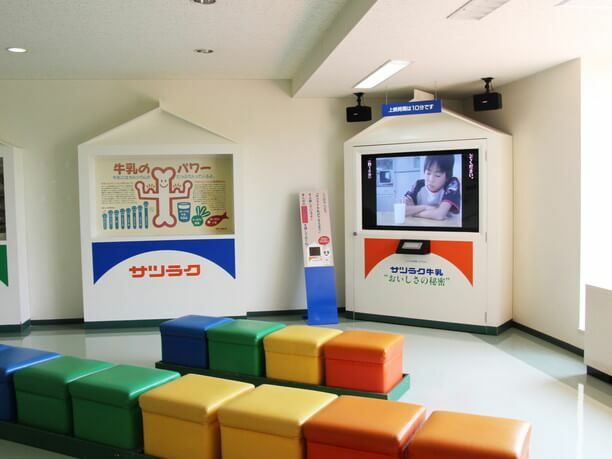 From the center of Sapporo city, catch the bus at the Toho Subway Line Kanjo dori Higashi Station bound for the “Nakanuma elementary school dori.” It takes 20 minutes. 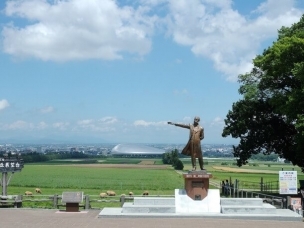 “Satsuraku milk no Sato” is located on the Sapporo Land’s complex premises. Their milk is packaged in an automated factory! 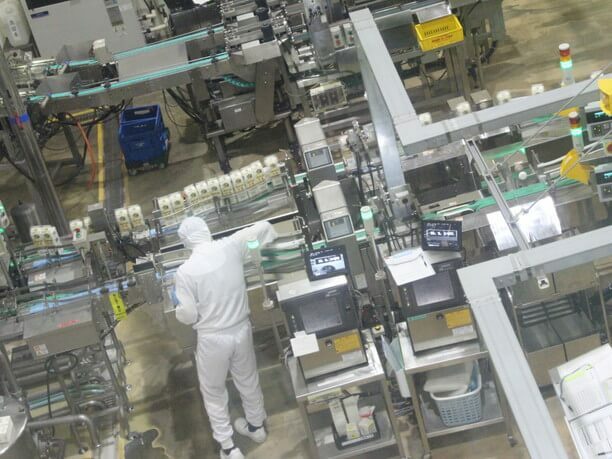 The milk pavilion is open to the public so that you can actually observe the production process of milk, pudding and yogurt of the SATURAKU brand. 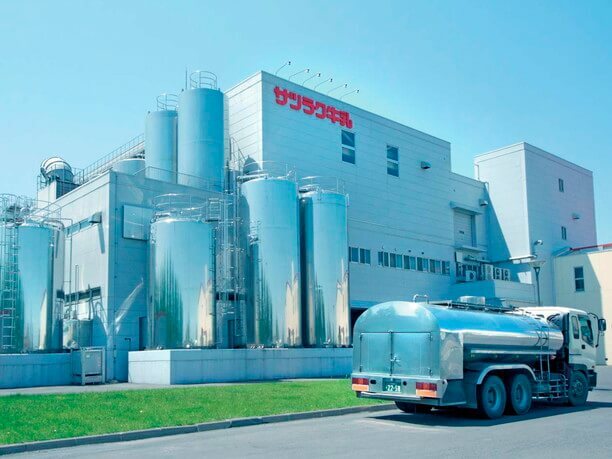 The factory fills about 100 thousand 1 liter milk cartons per day, along with about 100 thousand units of pudding and yogurt. There is a huge machine in the factory that steadily packages milk. It is almost fully automated. The tour takes about 20 to 30 minutes. If you choose to tour without a guide you can learn more about the milk and dairy products with the images and panels they provide. A guided tour with a member of the staff is available on weekdays and requires more than 10 persons to take part. Reservations are required at least three weeks in advance. Experience how the cows are milked! There is a barn at the Cow’s Hall, where you can interact with the cows actually being raised. You can also participate in a calf feeding experience on Saturdays, Sundays and public holidays. In the building, panels and dairy materials on the mechanism by which cows will produce milk are displayed. 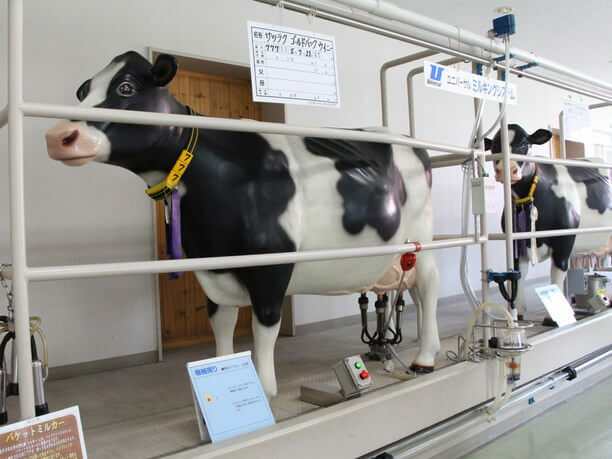 There is also a pseudo-milking experience (100 yen per time) using a full-size model of a cow! You can buy souvenirs of enjoyable soft-serve ice cream and dairy products! There are restaurants, barbecue houses, and shops inside the premises. The soft-serve ice cream (300 yen) is very popular! Their vanilla ice cream has a strong taste of milk. In the restaurant Makiba, you can taste Makiba Plate (750 yen) and Milk Ramen (750 yen). 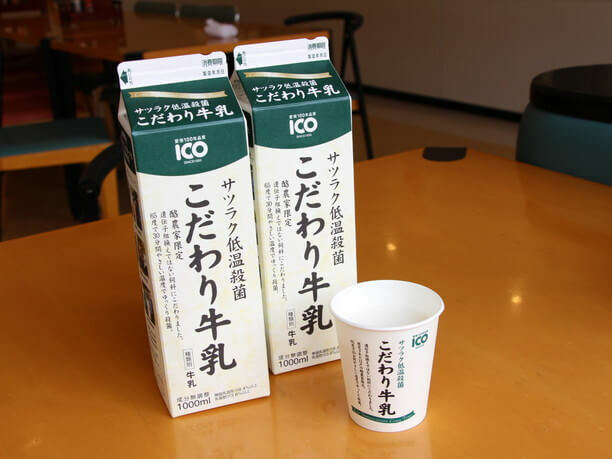 While you are eating your meal, you can also enjoy all-you-can-eat drinks with Satsuraku milk! 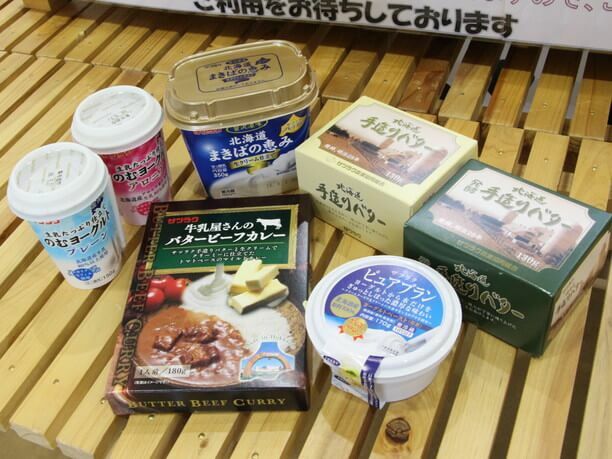 Something not to be missed here is a buying a souvenir such as Satraku brand butter or yogurt. 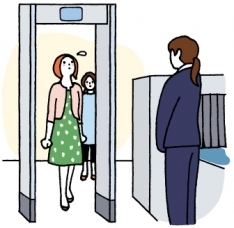 Do not forget to check for some unusual items that you can not get at the airport! Six kinds of soft cream are available: vanilla, yogurt, chocolate, chocolate mix, strawberry and strawberry mix. There is also a mini-vanilla 250 yen. Besides that, there are also seven types of their popular gelato (300 yen). In the summer season the barbecue house has a charcoal fire in the open air. If the weather is nice, you can enjoy an outdoor barbecue while being refreshed by the winds of Hokkaido! There are sheep in addition to cattle that you are able to visit freely. They also have a feeding experience on Saturday, Sunday and holiday. So try feeding the sheep with your own hands! 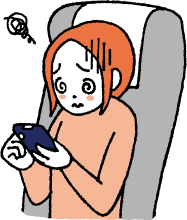 It is slightly inconvenient to go without a car, but it is convenient to share a taxi with several people from Toho Subway Line Shindo higashi station or Sakaecho station. 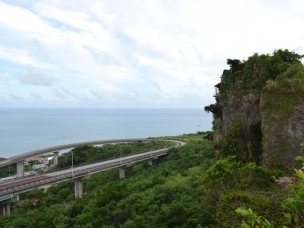 Sato Land and Moerenuma Park are close by so they can be visited on the same trip! 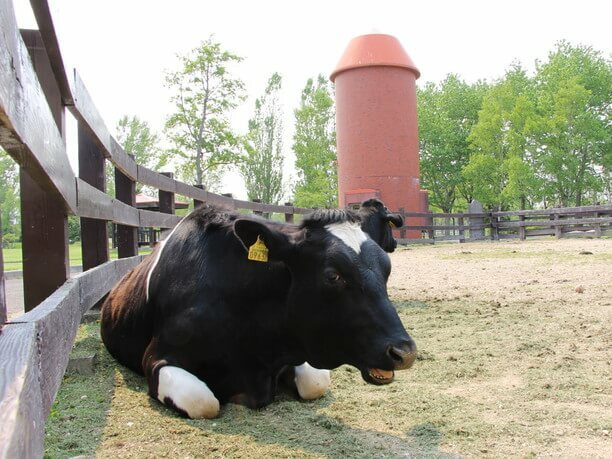 Visit the Yukijirushi Meg Milk center and learn the history of dairy farming! 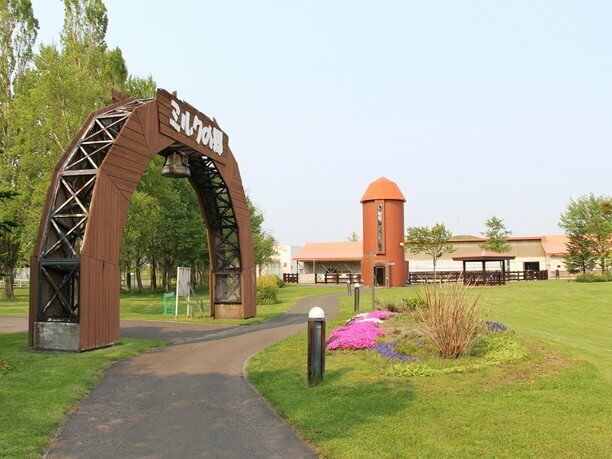 Visit Sapporo Sato Land and experience beautiful scenery and animals! Enjoy Sapporo Beer Tasting after a tour of their Hokkaido Plant! Enjoy the gorgeous winter lights at the Sapporo factory.